Across our grounds and throughout the St. Louis region, the Garden promotes the value of community gardening in partnership with other local organizations dedicated to keeping the St. Louis area growing. Gateway Greening, Inc. is dedicated to community development through neighborhood and community greening projects and is an affiliate of the Missouri Botanical Garden. The purpose of the Community Garden program is to support neighborhood groups committed to creating successful food-producing gardens and urban greening projects. Gateway Greening is committed to the long-term support of these projects and they provide the resources and educational opportunities that enable community gardens to successfully develop food producing gardens and landscaped areas on public land. Gateway Greening currently supports over 200 community, school and youth gardens. Visit their website to browse the resources available to those interested in starting a community garden or finding one to join. You will find information about the community garden program, starting a community garden, community garden grants, a list of community gardens in St. Louis, and other community garden resources. 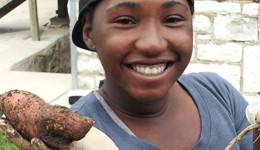 The Sweet Potato Project teaches inner-city “at-risk” youth alternative and progressive ways to produce and distribute locally grown products as well as sustainable business and entrepreneurial skills that can change their lives and enhance their careers. In collaboration with the North Area Community Development Corporation, the Garden sponsors the Sweet Potato Project and hosts a dedicated section of the William T. Kemper Center for Home Gardening where sweet potatoes are grown for the project. 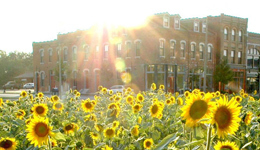 The Sunflower+ Project: StL is one of 4 winners of the St. Louis Sustainable Land Lab Design Competition, created to test experimental uses for vacant land in the city of St. Louis. The team is lead by Richard Reilly of the Missouri Botanical Garden's EarthWays Center and Don Koster of Washington University's Sam Fox School of Design and Visual Arts.